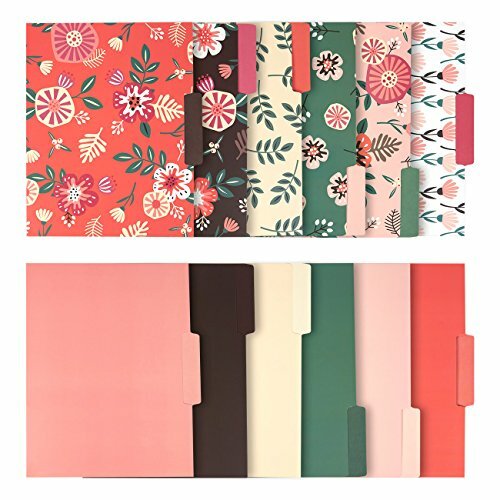 Give a touch of designer flair to your next organizational clean-up with these adorable 12 Pack of Floral File Folders! Folders' floral design gives a touch of designer flair to your office or your classroom. The set comes with 12 different file folders, ensuring variety when in use and plenty of space to place your files. Folders can be used in Filing Cabinets, Offices, Classrooms and Doctors' Offices. FILE IN STYLE: This 12 pack of pretty designer top tab file folders offer a modern spin to a simple organization necessity. Elevate your desk décor by storing documents, receipts, and notes in style and keep yourself organized at work or school. DESIGNER FLAIR: Bold bouquets and foliage burst forth from these striking designs. This set comes with 12 different file folders in a combination of warm and neutral hues for a colorful yet unoverwhelming palette. HEAVYWEIGHT MATERIAL: File folders are made of heavyweight 300 gsm paper stock with a thickness of 14 points, ensuring a durable and tear-free experience. QUICK AND EASY IDENTIFICATION: File folders feature assorted position 1/3 cut tabs and different colors to help you organize different types of files with ease for quick and easy identification. MEASUREMENTS: Each file folder measures 9.5 x 11.5 Inches to fit letter sized documents.